If you catch a northern pike in Lake Washington — or any other Washington lake, for that matter — do me a personal favor and chop its head off. Slash its gills, slit its belly, hack it in half, singe the carcass over high heat. Ahem, I apologize for letting fly such murderous thoughts on a Wednesday morning. But I’m still scratching my head about what a bass angler was thinking when they caught and released one of the nonnative predators just south of Mercer Island in recent weeks. It was the second pike captured in the big metro lake since early 2017, both of which could have only arrived in Lake Washington via someone’s livewell or cooler, just like the infestation of walleye. Hell, we don’t need a border wall, we need a pike wall to keep these illegal piscine immigrants from spreading further into the state from the northeast corner. And we should task the Washington National Guard with chasing down the bucket biologists responsible for it! It’s possible that this particular basser was just really confused about what to do with their unexpected catch. With two growing boys, lord knows I’ve been known to offer the advice “Better safe than sorry.” Who wants a ticket from the gamies for violating some arcane rule? But I’ll bet today the angler might choose differently — at least, I hope they would. Pike are an invasive aquatic species — the seventh most unwanted in the entire million square miles of the Western United States, according to a recent report. They pose a huge threat to native species and the restoration of salmon in the Upper Columbia, as well as downstream should they get past Grand Coulee and Chief Joseph Dams. So let’s go over the rules for this Fish and Wildlife Commission-designated prohibited species. Per WDFW’s fishing regulations, there is no minimum size on northern pike, there is no daily limit on northern pike, there is no possession limit on northern pike. All northern pike hooked and landed by anglers are required to be killed — and a wooden stake must be pushed through the fish’s heart. I doubt WDFW will do that anytime soon, but I like what the Colville Tribes are doing. 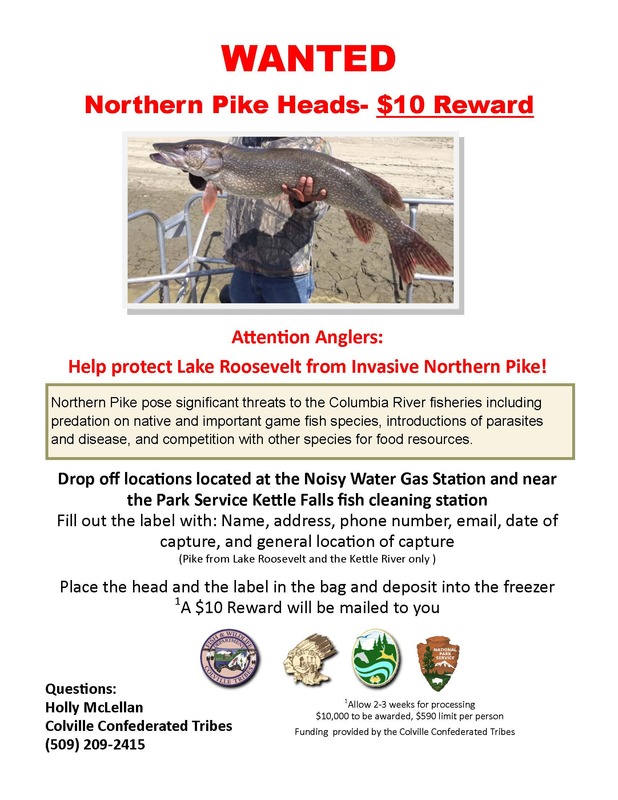 This year they’re again offering a $10 reward per pike caught on Lake Roosevelt and the Kettle River. So in that spirit, I will pay $50 to anyone who brings me a northern pike AND CAN PROVE via video and pictures beyond a shadow of a doubt that it indeed was caught in Lake Washington. We’re at 14240 Interurban Avenue South, Suite 190, Tukwila, WA 98168, less than 7 miles from the Gene Coulon Ramp, and open Monday through Friday, from 8 a.m. to 5 p.m. The *!&#!#@ gamies are directly irresponsibly responsible for this kind of crap! I was cited and fined when floating down a bit of a river several years ago, dragging along a plug of some sort, actually hoping to snag some hammerhandles, bullheads or other junk fish, and suddenly out of the weeds pops a f@#!$* game warden, screaming at me to stop immediately and paddle directly to him! He asked me what I was fishing for, and told me I was lying. I hadn’t been a Washington resident for even 10 years yet, and didn’t have a fishing license, so I considered my fine to be a donation to an otherwise good cause. Still, I’ve never been treated so badly by any public servant. The problem is: precisely this.